We talked recently about Adidas’ new fitness technology and more specifically about how the Adidas MiCoach elite system is going to trial with MLS in the States. Where the Elite system focusses on measuring the players the new Adidas MiCoach Smart Ball is all about measuring the football itself. The Smart Ball could be a revolution for the beautiful game. It has the potential to radically change the way that coaches analyse the game and the way that their players play it. This will be made possible by the Adidas technology that will sit inside the ball itself, allowing the technology to measure the balls spin, trajectory and velocity. This data will be fed through to the coach via an accompanying smartphone application (initially launching on iOS only) which will be fed its data in real time via Bluetooth. 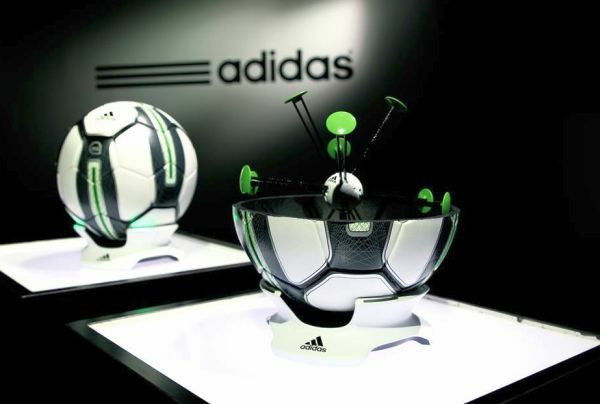 Adidas recently hosted a Lab event in central London where they demo’d the technology in action. From the outside, the smartball appears like any other football. It’s clearly robust and capable of taking some Bobby dazzlers. It’s essentially equal in looks to a high end release that you would expect for a World Cup, European championship or other similar global, blue ribbon football tournament. The one external design that marks this ball as different is the green zones that are printed on the outside of the ball. These are intended to help you to kick the ball in the way necessary to achieve the desired goals with the technology. The real difference lies inside the ball, outside of view. The Adidas Smart Ball contains a specially adapted spring-mounted sensor which enables it to capture the balls movements in order to relay the data back to the app. This data arrives via Bluetooth 4.0, to their iPad or iPhone app. The data validity is yet to be truly determined, but all of the first impressions stand up. 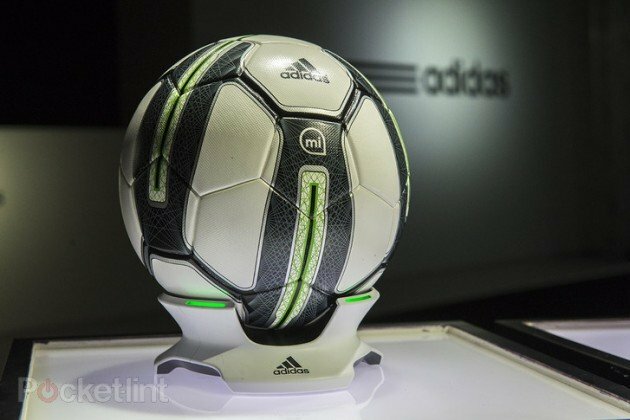 The ball needs to travel a minimum of 10 metres for data to be collected, and no maximum distance has been confirmed by Adidas. It’s possible that longer distances will bring syncing issues, or even data loss, but that’s speculative. Besides, the main aim of the miCoach Smart Ball technology at the moment seems to be to aid in set play practice, such as free kicks and penalties (pretty much anything that involves shooting seems to be emphasised over passing at the moment). Within the app, you can set up the software to meet the goals of your practice session. There kick it for a casual session (which seems slightly pointless in our opinion). Then there’s a set of challenges, including free kicks. It would be a joy to be a coach watching the likes of Cristiano Ronaldo and Gareth Bale practicing free kicks with Kick It. The app shows the trajectory of the ball, and you can pinch and zoom around the app to view this in great 3D detail. Within the training element, the green markers on the exterior can be used to aid in practicing swerving the ball, and the immediate feedback from the app can help players to get more swerve, dip or lateral movement into their set plays. You’re also fed back the velocity of your strike in MPH. One thing to bear in mind is that the Smart Ball has brought the pain of charging to the simple pleasure of kicking a ball around. 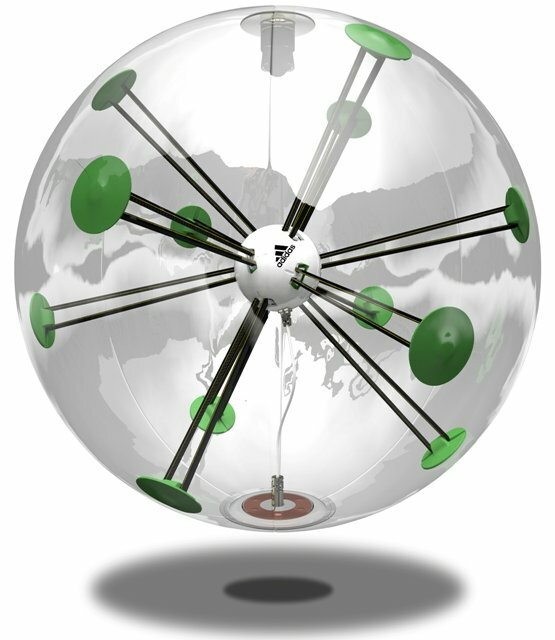 The ball comes with a charging cradle that you sit the ball on in order to power it up. According to Adidas, one charge will power a whole days’ worth of play but full battery spec has not been disclosed, and my experience with smart devices in general makes me fear that the power may sap somewhat faster. Adidas will launch the miCoach Smart Ball sometime in 2014, most likely around the World Cup.